Beachfront Condo with Free Beach Service, Beachfront Pool, and MORE! Reserve your beach vacation at Sea Oats #208 on Okaloosa Island in Fort Walton Beach, Florida. Sit out on your private balcony and enjoy the spectacular Gulf views as the waves lazily roll onto the shore. Located near it all on Okaloosa Island, you can dine at local favorite restaurants serving fresh seafood, and visit nearby beach shops to stock up on all of the necessities for having some fun in the sun. 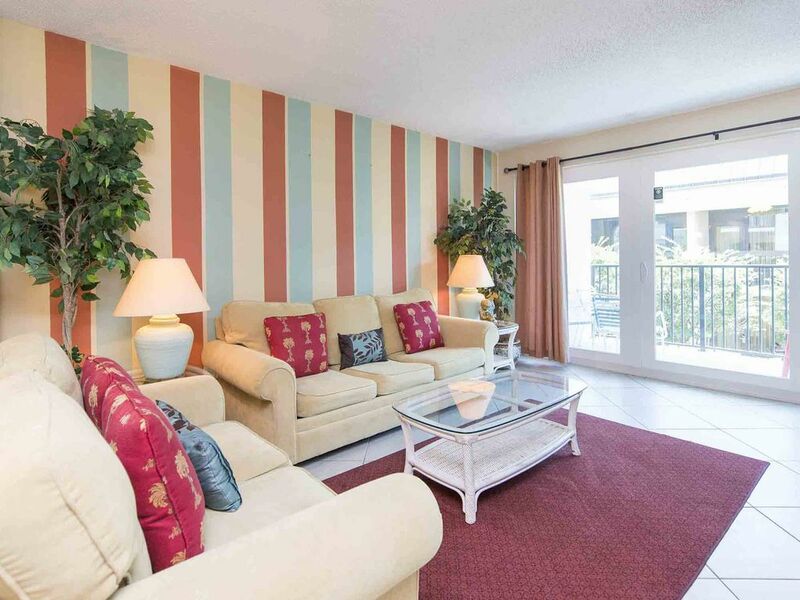 This 2 bedroom condo sleeps up to 7 people, making it the perfect choice for your family vacation. Enjoy your stay in the sunshine state. Thank you for your feedback. We apologize you were not able to use the balcony during construction. However, since construction has been completed we hope that you will join us again next summer for another great stay! We enjoyed our stay here! A very short walk to the beach which was nice. Unfortunately there was June grass in the water the week we were there so we did drive further east to get to clearer waters. It finally went away the day before we left. PROS: The place was a lot more spacious than I expected. The small washer and dryer was very helpful. Kitchen was adequate for meal preparation. Sea Oats has rolling carts near the elevator to get your stuff to and from your car. Response to fixing patio sliding door was prompt. There is a view of the water if you are out on the patio and looking right. We were very comfortable here for the week. We took side trips to Pensacola, Henderson State Park, and Panama City Beach. We also went parasailing nearby behind Fuddruckers. Suggestions: More towel racks or hooks for air drying bath towels. Fix towel rack in the guest bath. Provide a notebook with local brochures or a blank guest journal where guests can leave notes about their stay and recommendations for local eating places, shopping, entertainment, etc. Provide a few boogie boards to borrow and some inexpensive low beach chairs that can be close to the water. Thank you, we had a great time! Thank you for your review. We're glad you had a great time at this condo and had fun parasailing! We have let our management know about your suggestions as well. We hope you choose Southern again for your future stays! Problems with door sticking/keyless lock it condo was nice, clean and well stocked! Well stocked with linens, bath towels and kitchen cleaning. Few issues with door jamming or swelling to gain entrance to condo.